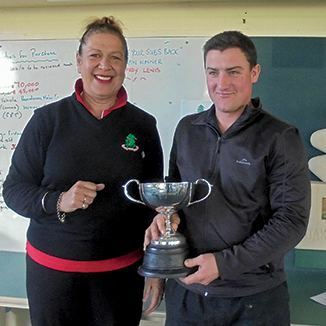 Karaka Million winner Johno Benner has added another trophy to his growing haul, the Otaki Golf Club’s Senior Men’s Champion. With Vespa, the Otaki trainer last year won the prestigious New Zealand Bloodstock Karaka Million at Ellerslie and with his partner Hollie Wynyard he is now preparing the three year old colt for the coming season’s calendar opening with the Group One race in Hawke’s Bay at the end of August. When he’s not training horses Johno Benner is likely to be found swinging a golf club for the Otaki Golf Club’s pennants team or kicking a football for Kapiti Coast United. 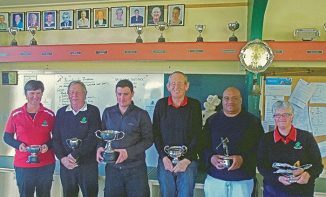 Last weekend it was golf and the final round of Otaki Golf Club’s Senior Men’s Championship pitting Johno Benner against Dave Marshall for the title. Runner-up in 2014, Johno Benner made sure of the title this year.